John Fritz knew he had to be realistic in his fist big league camp in 1994, he told his hometown Beaver County Times that February. But he also knew he had an opportunity. "I'd just like to leave them with a good impression," Fritz told The Times, "so they'll keep me in mind if they need a starter sometime during the course of the season." Fritz was at that first camp that spring going into his seventh season as a pro. While the Angels may have kept him in mind, they never called him to the majors. 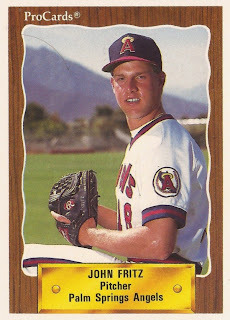 Fritz' career began in 1987, taken by the Angels in the 27th round of the draft out of Beaver Falls High School in Pennsylvania. He didn't hit the field for the Angels until 1988 at short-season Bend. The club gave Fritz the option of finishing the 1987 summer Legion season before signing. He went five innings in an August 1988 game for Bend, giving up one earned. Overall, he had 14 outings, seven starts and a 3.65 ERA. Fritz made high-A Palm Springs in 1990, then single-A Quad City in 1991. He returned to Quad City for a full season in 1992 and went 20-4, with a 3.03 ERA. That 20-win season, The Quad City Times wrote in 2012, is a mark that hasn't been matched anywhere in the minors since. "It was kind of the perfect storm," Fritz told The QC Times then. "We had a great offensive team that scored a lot of runs, and that allowed me to pitch deep into games on a regular basis." Fritz made both AA Midland and AAA Vancouver for 1993. He got eight outings, seven starts at Vancouver, going 3-1, with a 4.07 ERA. He was a league All-Star in Midland. Fritz returned to both Midland and Vancouver for 1994. He didn't get a call to California. It was also his final season with the Angels. He moved to the Brewers and AAA New Orleans for 1995. That July, he told his hometown Times that he thought he still had a chance to make the majors. "We'll wait and see," Fritz told The BC Times. "I've been in this game for eight years now and I've learned not to get too excited about things." Fritz got into 41 games for New Orleans that year, starting six. He had a 3.97 ERA. It was his final year as a pro.